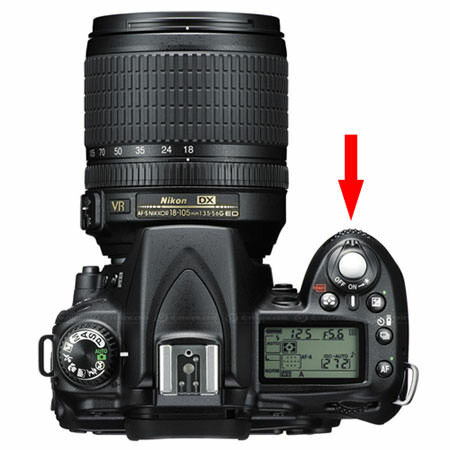 This is a very quick tip on how to change aperture on Nikon D80 and D90 DSLR cameras. Make sure that your lens aperture can be changed through the camera. If you are using an older lens with an aperture ring, make sure to set the aperture on the lens to the largest number. There should be a lock on the lens to keep it at that number. If you are getting an error on the top screen of the camera with the lens mounted, you should go back and make sure that the aperture ring is set correctly. This is not an issue on most new lenses and the latest generation of the Nikon lenses labeled with a “G” do not have this ring at all. For example, neither the Nikon 18-105mm f/3.5-5.6G VR nor the Nikon 50mm f/1.4G lens have the aperture ring. Set your camera on “Aperture Priority” mode by rotating the dial on the top of the camera to “A” position. In Aperture Priority mode, you set the lens aperture manually, while the camera picks the right Shutter Speed for you. Rotate the front dial of the camera located under the camera shutter release to change aperture. Rotating to the left will decrease the aperture, while rotating to the right will increase the aperture. When you decrease the aperture, the aperture setting will stop at the maximum aperture the lens allows. For example, on the Nikon 35mm f/1.8G lens, aperture will stop at f/1.8. There is also a limit on minimum aperture on each lens and you cannot go higher than that limit as well. Typical minimum lens apertures are f/16, f/22 and f/36. Lens apertures work a little differently on zoom lenses and the minimum/maximum aperture depends on what focal length you are using on the lens. For example, if you are using the Nikon 18-55mm f/3.5 lens and you are zoomed out at 18mm, the smallest aperture number you can use is f/3.5. However, if you zoom in to 55mm, the aperture will be limited to f/5.6 and you will not be able to go lower than that. The same principle works on all other variable aperture zoom lenses. By the way, you can also change the camera to “Manual” or “M” mode on the camera dial to change the lens aperture. However, you will then have to manually choose the camera shutter speed and you will need to have a good understanding on how to photograph in manual mode and how to use the built-in light meter of the camera. i find your site very informative and has helped me in understanding and improving my photography skills. yesterday, i was practicing on taking pictures of running water (freeze), just a small question how do you set your aperture and shutter speed when shooting a running water? i mean i tried many times but failed to get the photo that i wanted (freeze of the water). can you help me out on this? by the way i used a d90 with 18-105mm lens. If you want to freeze water you will need to slip the camera into shutter priority and choose a higher number, such as 1/800th or more. Because you are shortening the amount of time the lens will be open, you need to widen the aperture to let in more light (if the aperture is too small, not enough light will get through and your picture will be under exposed. So.. as you speed up the shutter, you need to compensate by widening the aperture to let in more light during that brief time. You will find however that you get a better water effect by slowing down your shutter speed and closing down the aperture a bit, the water will have a silky, etheral quality that a lot of people seem to like. Sir, I am trying to find the sequence of full stops between 30 sec to 1/1000th sec of a Nikon D800 camera. Unlike other camera manufactures, Nikon I believe use 1/2 to 1/3rd stops as well. The reason for this is that I have just pourchased a 9 stop ND Filter and I want to trace the sequence of stops it takes. It would be much appreciated if you could help. Thanbk yuou. Does that button change the aperture or the shutter speed?? How does the aperture work with an older lens? On a D90 you can lock the aperture at the largest number (which is the smallest hole, least amount of light, slowest f stop) so how does the camera actually utilize the amount of light possible from that lens when f stop is already set to the slowest possible setting? Is there a mechanism inside the lens that automatically changes the aperture while taking the picture? Does the camera really not utilize the full functionality of the lens? How is this working? I apreciate the brief explanation,i’m a regular user of nikon product been that am amateur photographer hw do i improve on the settings of my camera in studio or aside the studio. hello, I’m a new mom and just purchased a Nikon d80 to take pictures of my baby. Of course I started taking pictures on automatic but have been playing around with manual and other settings. I just need a setting that I always use for indoors and a setting that I can use for outdoors. Please help. Thank you.